Our weather will stay fairly quiet through the weekend, as we cruise through one of the warmest February months ever recorded in New Jersey. New Jersey has been holding steadily above normal since last Saturday. Our dormant, mild weather pattern continues through at least next Saturday, with another surge of near-record temperatures surrounding Thursday, the warmest day of the week. Consequently, Tuesday looks like the relative coolest day of the week. Morning temperatures have been quite chilly, with thermometers hovering in the 20s and 30s - it actually feels like February! Even though clouds will increase significantly through Tuesday morning, high temperatures for Tuesday afternoon should reach the upper 40s to lower 50s. That's still on the mild side, around 5 to 10 degrees above normal for late February. A weak storm system will fizzle over New Jersey in the Tuesday late night-Wednesday early morning time frame. Light rain showers and/or sprinkles will be possible, especially for the northern third of NJ (above Interstate 78). Otherwise, the overnight will feature cloudy skies and cool temperatures, bottoming out near 40 degrees. I think those temperatures will be warm enough that icing concerns will be nil - but I'd watch out for scattered icy spots in the higher elevations of NW NJ on Wednesday morning, just in case. By around lunchtime Wednesday, skies should break into sunshine once again. And so our next warmup will kick into high gear! High temps for Wednesday are forecast to end up in the lower 60s for most of New Jersey. To borrow a term from the National Weather Service's technical discussion, record highs for Wednesday are "vulnerable". In other words, the record highs for Wednesday are a few degrees lower than the rest of the week, so we have a chance of breaking them. It's just the way the statistics play out. 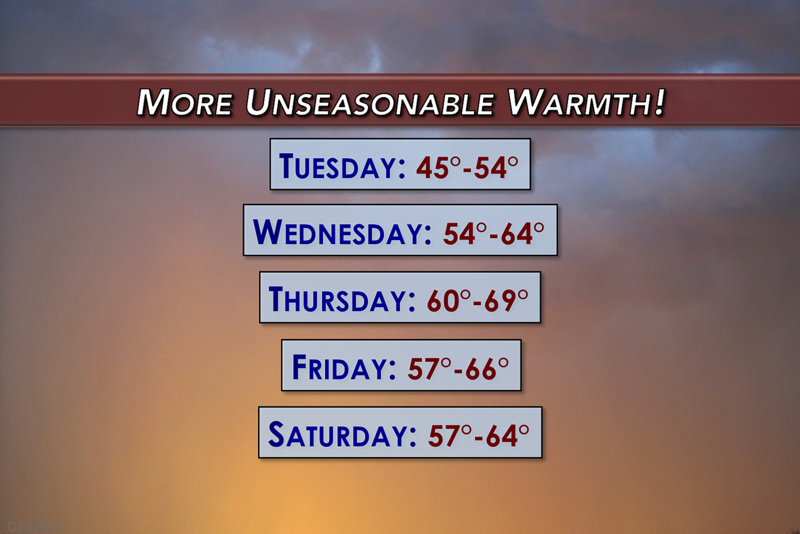 As I mentioned already, Thursday promises to be the warmest day of the week. A pleasant mix of sun and clouds and a brisk southerly breeze will push temperatures into the mid 60s for much of the state. South Jersey could see upper 60s. And I certainly wouldn't rule out isolated 70s, yet again. The forecast for Thursday evening includes a question mark - the NAM model stands alone in predicting a quick round of showers just after sunset on Thursday. There's not even a blip on any other models, so I've kept this rain chance out of my written forecast. But it bears watching, especially if the temperature forecast goes up, providing more potential energy for convection. Thick clouds take over the Garden State on Friday. So we'll end up a bit cooler, but 60s are still a good bet. We'll get one more day of 60s for Saturday, but that's when changes will begin, as a storm system arrives. Given the warm temperatures and elevated humidity, a line of gusty showers and even thunderstorms will be possible sometime Saturday. The timing of this round of wet and potentially stormy weather is still uncertain (right now, I'd call it Saturday afternoon). So I'd keep any weekend plans as flexible as possible as the forecast continues to evolve. Cooler air returns Sunday into Monday, as high temperatures return to seasonable lower 40s with a brisk northwesterly wind. Finally, let me address a budding question I've been asked at least a dozen times in the past week... Can we declare winter over? Not by a long shot. There's still plenty of time for cold air to surge again and for significant snow. March is traditionally a very snowy month for New Jersey (Blizzard of 1993, anyone?) And we can see accumulating snow into April too. Our next chance for minor snow would be early next week. Our next chance for significant snow would be the first weekend of March.